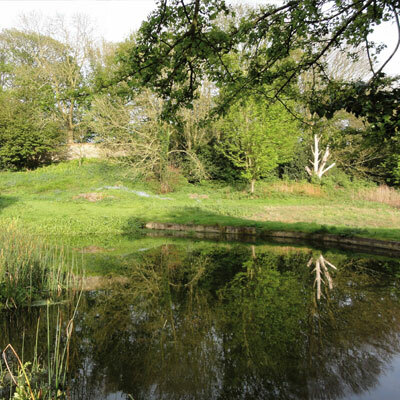 From Jacobs Place a ‘looped trail’ continues towards ‘Obelisk Plain’ where two of Holt’s most interesting landmarks are located, both bearing their own stories. 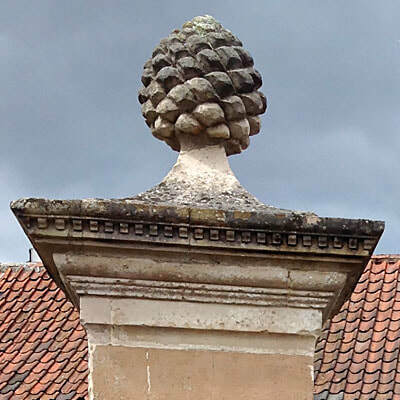 The pineapple-topped Obelisk is one of a pair of gateposts relocated from Melton Constable Park, the other was given to the town of East Dereham in 1757. Each stone panel bears the distance in miles to various locations in Norfolk, calculated correctly when the gatepost originally stood at the entrance to Melton Constable Hall and the reason why the mileages are not at all accurate from Holt. 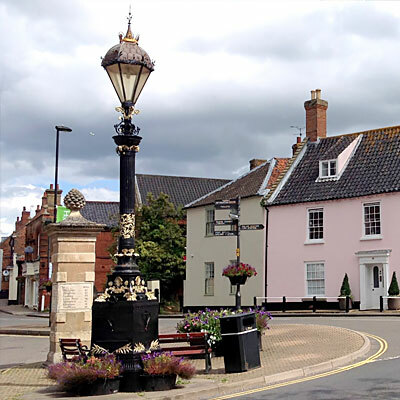 At the start of World War II the townsfolk of East Dereham decided to dump their obelisk down a well so as not to assist the enemy in the event of an invasion. The four panels on Holt’s obelisk were simply white washed over! The Queen Victoria Golden Jubilee Lantern was erected in 1887 and originally stood in the centre of the Market Place. In 1921 the Lantern was moved to Obelisk Plain in order to make way for Holt’s War Memorial. The light was powered by the town’s rather unreliable gas supply proving so erratic that the light was more ‘off-than-on’, earning it the nickname of ‘Blind Sam’. 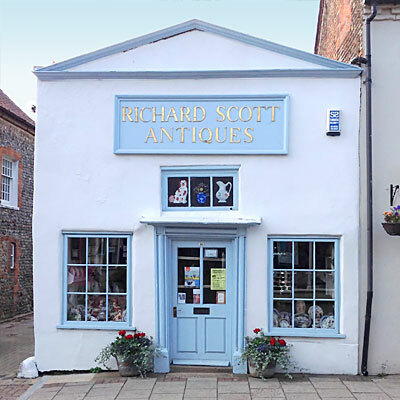 The copper lantern housing mysteriously disappeared which prompted a restoration scheme in the 1990’s where an exact replica was built using the original design drawings. 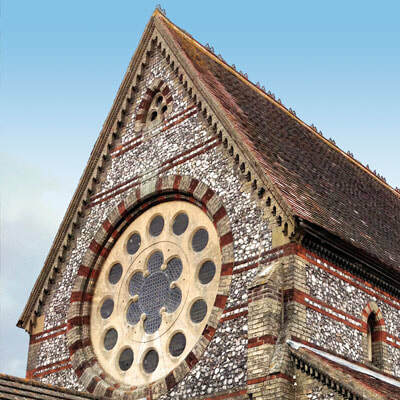 The High Street terminates where it reaches the A148 King’s Lynn to Cromer road but dominating this busy ‘T’ junction is the United Methodist Chapel, designed by Thomas Jekyll of Norwich, and considered to be one of the finest examples of Victorian church architecture in the UK. Built in 1863 for the then huge sum of £2,000 the turreted spire was originally designed to accommodate a clock, but the high building costs meant the circular brickwork panels remain empty. Please take great care if you visit Holt Methodist Church or the nearby Spout Hills Common signposted from Obelisk Plain. 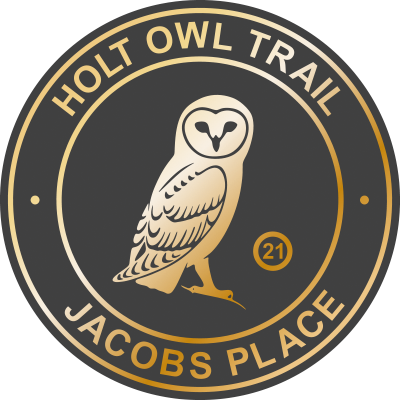 The Holt Owl Trail now crosses the High Street to Plaque 22.